Birchall is an absolute gift at this price. $350,000 means that he has been priced at an average of 48.2! For a player who’s last season averages read 69*, 81, 82, 81, 89 and 90 to be getting him for 48.2 is a steal. That * next to 69 was his injury interrupted 2017 where he only played 5 games before tearing his PCL. That 80 point average means you’re getting Birchall this year for close to half the price of his potential. Even with the Hawks going through a slight rebuild the last few years with Sam Mitchell, Lewis and Hodge among other senior players all leaving, experience around the ground is still crucial especially when it comes to the backline. In Birchall the Hawks have a 4 x premiership defender who’s disposal efficiency rarely drops below 80%. Even after missing most of 2017 and the entire 2018 home and away season, the Hawks were preparing for finals and hoping they could still bring Birchall in. In short, if Birchall is fit he will play. That disposal efficiency also meant he was often the target of the oppositions forward tag but you’d have to think with how Sicily has come along he’d be the main target for that attention now, hopefully benefiting Birchall with more freedom to get involved in those chip around defence plays to add to his score. Another possible addition in his score could come from the change in the kick in rule. While I’m seeing a lot of people sold on the fact that Sicily, Burton and Hardwick took most of Hawthorns the kick ins last year, Birchall wasn’t there. When he was (back in 2016) he and his over 80% disposal efficiency were trusted with the majority of kick ins, broken down by Freako below. Meaning if he assumes that role again you can bank quite a few extra points a game. Before injury derailed his 2017/2018 seasons, Birchall was about as reliable as they come. Only going under 20 games in 4 out of his 11 seasons, with 2 of those being 18 and 19 games. He has had a difficult run lately but it shows that when his body is right there isn’t much that stops Birchall from getting out on the park. While his durability has been one of his biggest assets through his career, unfortunately he has struggled to get on the park over the past 2 years. His PCL cost him the majority of 2017 and took 2 surgeries to get right. Eventually after rehabbing his way through 2018 he almost got ticked off to play finals before an abductor injury flared up and ruled him out. Birchall recovered from that and started running in December before requiring more surgery to remove floating cartilage in his troublesome knee. Hawthorn are hopeful Birchall will start running again in January but that is still a pretty interrupted preseason. While an 80 point average is great through the season, unfortunately Birchall is guilty of producing a high Standard Deviation. What this means is that while his average his 80, instead of scoring close to his average each game his scores tend to vary anywhere from 60 – 110. In his last full season he scored 6 games in the 60’s, 6 games in the 70’s, 7 games in the 80’s and 5 games over 100 with the highest being 115. These scores have been pretty indicative of Birchall’s last few seasons and show that while you can trust he’ll end up with an 80 point average at the end of the year, you need to be prepared to take a few 60’s throughout the course of the year. JACK– This year I’ll be treating Birchall as an expensive rookie. If he runs out in round 1 I can’t turn him down at $350,000. Whether you bank the cash he makes during the byes or keep him for the whole season will obviously depend on how he’s travelling but when he’s fit and firing we know all know he’s a proven gun. May as well lock him in now while he’s a bargain! 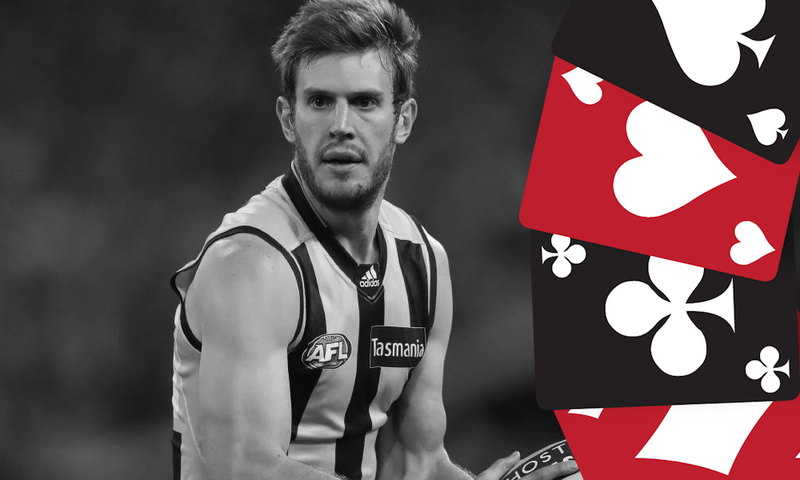 If named round one, will you most likely select Birchall? FOLLOW US ON TWITTER: @anthonydsmith86 for all thing AFL Fantasy (and more). Got something to say about the deck? Use the hashtag… #DeckofDT. He is definitely a must have if named round one! Btw, if the scores are generally not close to his average, then its a high standard deviation. That Freako stat is huge. If he took 100% of kicks out of the square, he’s average 15.8 points more… 75% would see him at about 11.9… in my calculations, I would be thinking a 10 point bump is quite realistic. But obviously the SicDawg will have something to say about all of that. Back in the day we had a vest watch… and predictions. Now it will be all about who is the designated kicker!